The SafeAir badge provides an immediate visual indication when a specific chemical hazard is present. The sensor in the SafeAir badge is constructed from a coated indicator layer rather than impregnated paper, thus providing a homogeneous and stable color change. The badges are highly sensitive and selective to the targeted chemicals. A color change, in the form of an exclamation mark, warns the presence of the targeted hazard. 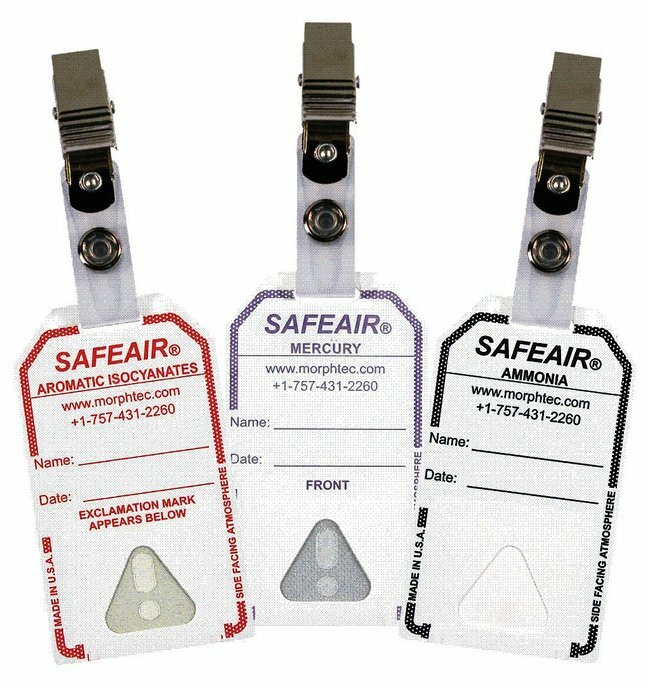 The SafeAir system is a low cost chemical detector badge. The badge requires minimal training. There is no calibration, extra equipment or laboratory analysis required. Often chemicals coexist in the same environment. The SafeAir chlorine/chlorine dioxide badge selectively indicates the presence of chlorine on the front side of the badges and chlorine dioxide on the back side. Indications may appear on both sides if both chemicals are present. Non-selective multi-purpose badges are available for TDI/MDI and hydrazine/monomethyl hydrazine. Individual color comparators may be used to quantify the exposure of the specific chemical. The mercury and 1,1-dimethyl hydrazine badges provide the user with two independent threshold levels. The front of the badge indicates one threshold level while the back provides a second level. This unique feature allows the badge to be used as an inexpensive range finder. For higher resolution and wider range, the SafeAir badges can be used with the SafeAir color comparator. Slide the SafeAir badge with the exclamation point facing up into the color comparator and turn the wheel until the colors match. Read the exposure dose in the exposure dose window.